Mama's Nursing Home (like many others) has been quarantined for the last nine days due to a virus outbreak. It has been NINE loooong daze! The limited amount of recreation has stopped altogether leaving Mama with even MORE time on her hands & even LESS socializing. This did not stop Doug & I from visiting, even though visitors were "strongly discouraged". 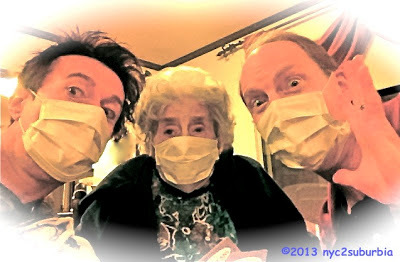 We all wore masks, just like the staff & residents. It seemed odd & Mama hated every minute of wearing it. Mama: I had a crazy dream last night. Vin: What did you dream about? Mama: I dreamt you got married. Vin: Really? How was the wedding? Mama: I said to you in my dream "What the hell are you getting married for? The three of us are already so happy together." Vin: Oh, so now you're saying you're HAPPY? That's a first! (Under my mask I say to Doug that we're already married). Mama: Yeah, I'll be HAPPY when I can take this damn mask off & hear everything you're saying. I can't hear a damn word. Vin: Ahhh, yes, "so happy together"... for the moment.